This structure was built in 1922 at the site of the previous one which was destroyed by a fire. By January 1, 1951, the railroad officially retired and abandoned the 1922 shelter and removed it from the site. However, the Laurel Brook location continued as a flag stop of the railroad until the end of passenger service on August 31, 1954. Photo source: the railroad photography of David Hoover and Joseph Maloney, collection of Charles T. Mahan, Jr. 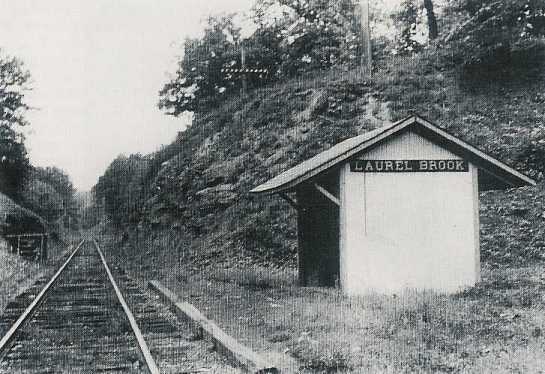 Going back to 1893, when it first appeared on railroad time tables, they always officially listed Laurel Brook as a flag stop station and it was never manned by an agent. They called the structure there a waiting shelter, not a station, and this practice continued through the entire standard-guage era. The Baltimore & Lehigh Railway built a vertical board-and-batten-sided flag stop station waiting shelter in 1893. They constructed it as per Pennsylvania Railroad standard station type W81 specifications. They affixed the Laurel Brook sign to the roof and parallel to the tracks. This was common practice for the period. Later, they usually identified the stations on the north and south ends of the structures. It was common for the Ma & Pa to have two separate milk platforms at station areas. When the coach of the normal two-car, coach and baggage/mail car, passenger train was brought ot a halt in front of the station's platform, the train's baggage car would always be spotted opposite a milk platform. With this two-milk-platform setup, it did not matter whether the train was headed north or south. The train's baggage compartment door would always be situated next to a milk platform for the efficient loading and unloading of cans or any type of freight. Fischer, Rudy, Scenes From Ma & Pa Country - Then and Now: Overshot Trestle & Laurel Brook Station Areas - Harford County, MD; TIMETABLE, Vol 16, Number 2, Spring 2000; The Maryland and Pennsylvania Railroad Historical Society, Inc.